Wine, as already said, has been produced in the Chianti region since antiquity. Documents in the care of the church of Santa Cristina a Lucignano signal cultivations of grape vines already before the year 1.000. Taste this other,/ Robust wine that one boasts / To be born in the middle of the Chianti / .../Majestic / Imperious / it walks within the heart, / And drives away of it without noise / Every anxiety and every pain... ". In 1716, the Grand Duke of Tuscany, Cosimo III, officialised it as "wine of protected denomination and origins. " During the Lorena family dominion the enology and the commerce of the wine have a strong development. The nineteenth century confirms the success of the Chianti wine prized also at the exposition of Paris in 1878; and it is in this same century that Bettino Ricasoli, then owner of the castle of Brolio, told the formula of the Chianti Classico. This includes the prevalence of Sangiovese comprising 75-90% of the mixture; with black Canaiolo, in the measure of 5-10%, and white grapes (Malvasia and Trebbiano) making up 5-10%. In future prospects, the Chianti wine will always have more body, more intense color and perfume and will intensify its typical aroma of cherries and sweet violets, thanks to a predominant acceptance of Sangiovese grapes. 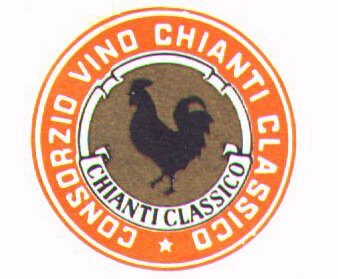 After that of 1924 the "Consortium of the Gallo Nero (Black Rooster) " and the "Consortium Vino Chianti Classico" (the transformation of the "Consortium of the Black Rooster" into the "Consortium of the Historic Mark" is recent) were estabilished. The two consortiums have different objectives: the historic Black Rooster promotes the mark within Italy and abroad, the "Consortium of Chianti Classico Wine" has assumed the roles of inspection, assistance, vigilance and tutelage of the denomination. The legislation DOC (Denomination of controlled origins) was passed in 1967 which confirms geographic limits and productions of the Chianti. In 1984 the State, with DOCG, took upon itself the regulations of these consortiums. The denomination "Chianti" is actually attributed also to wines of the surrounding areas, such to cover a territory of about 450,000 hectares, of which the Chianti Classico, in a strict sense, occupies about 70.000 hectares. More than 250 farms operate on this area with a combined production of about 300,000 hectoliters of wine: more than half of the wine produced in Italy,is exported to Germany, the United States and Japan. The international reputation of the Chiantian land is also connected to olive oil. The cultivation of the olive tree has very old origins, so old in fact that it dates back to the VI century BC, to the period of the agricultural development promoted by Roman civilization. In the successive centuries this plant has come to characterize the entire Thscan territory becoming one of its emblems together with the grape vines and the unforgettable cypress trees. Today Tuscans proudly affirm that their extra-virgin olive oil - which is obtained by the cold pressing of olives, without the aid of any chemical processes - is the best in the world; it is a very precious product because it is very scarce: it is enough to say that it constitutes only 3.6% of the entire national production. times and the technique with which the harvest is gathered, the type of pressing and the method of conservation strongly influence the quality of the final product. the Chianti Classico region derives from the pressing of four varieties of olives - Frantoio, Moraiolo, Leccino and Pendolino - in variable proportions. The olives are still worked in the traditional way: a brief stay in boxes, arranged in layers of 10-15 cm in height, they afe pressed and spun to separate the water of the fruit from the oily part. The product obtained by this procedure is then arranged in large terra-cotta oil-jars where it is conserved until it is bottled. The extra-virgin olive oil's easy digestibility matches to an high nutritional value rich of therapeutic properties: it in fact stimulates bile secretions, reduces the formation of cholesterol and helps keep the vascular system in good working order. Precisely to protect the origins and the quality of a unique product, the Consortium "Terre del Chianti Classico (Lands of the Chianti Classico Region)" has been instituted, which supports more than 120 oil producers.